I would like to begin this issue by offering a sincere THANK YOU to the more than 300 subscribers to The Rhea County Republican newsletter. This publication started out just over two years ago as a service to the members of the Rhea County Republican Party but, thanks to so many friends, it quickly spread to points all across the United States, as well as into Canada, England, and Portugal. I am sincerely grateful for the many compliments and encouraging remarks I’ve received over the past two years, and especially to those of you who have taken time to share your opinions, thoughts, comments, and ideas during this time. 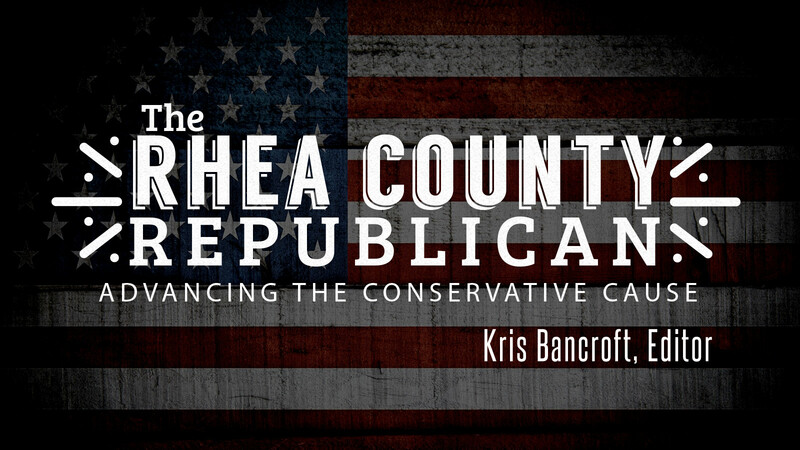 The Rhea County Republican is your forum for sharing your views. I look forward to hearing from you often in the days to come! 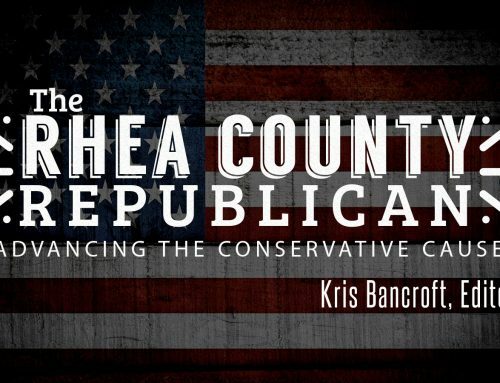 I would like to thank Elmer Harris, Managing Editor of the Rhea Review, for taking time to post each issue on the Rhea County Republican Party Facebook group; on average an additional 40+ readers per month are able to read this newsletter via the Rhea County Republican Facebook group. Thanks to those elected representatives who have taken time to email their comments; it means a lot to your constituents and other voters to know how you are serving our community, state, and nation. All said, your kindness inspires me to strive to make each issue better than the previous one. With your help – receiving your comments and ideas – I have a chance of accomplishing this goal. The purpose of this newsletter is best stated in its motto: Advancing the Conservative Cause. In each issue you will find data and analysis on pending legislation, comments from those elected representatives who take time to keep us informed about their activities and the issues of the day, an educational bit I call “Lagniappe” (French for “something extra”), and an editorial column. The Reagan Day Dinner for 2019 will be held at the Rhea County High School Auditorium. Tennessee Speaker of the House, Glen Casada, will be the keynote speaker. Tickets are on sale for $50 each or $275 for a table of six. Chairman Keith Flatness called the February 12, 2019 meeting to order at 7:00PM. Marvin Keener gave the invocation and Joe Gryder let the pledge to our flag. Guests introduced included: Liz Holloway, State Executive Committeewoman – District 12; Chuck Holloway; Randy Ellis, State Executive Committeeman – District 12, and; Suzanne Sapp, Chairwoman of the Bledsoe County Republican Party. Chairman Flatness announced the steps we would follow in the election of officers and named Laura Travis to Chair the Contest and Credentials Committee. Chairman Flatness nominated Bitsy Gryder to serve as Chairwoman on the Nominating Committee. There were no other nominations. Marvin Keener moved, Joe Gryder seconded, that Bitsy Gryder be elected by acclamation. The motion carried. Gary Drinkard was nominated by Laura Travis, Chairwoman of the Credentials Committee, to serve as Vice Chairman of that Committee. There were no other nominations. Chuck Bauer moved, Marvin Keener seconded, that Gary Drinkard be elected by acclamation. The motion carried. Laura Travis was nominated by the Nominating Committee to serve as Secretary. There being no other nominations, Marvin Keener moved, Joe Gryder sconded, that Laura Travis be elected by acclamation. The motion carried. Larry Pendergrass was nominated by the Nominating Committee to serve as Treasurer. There being no other nominations, Keith Flatness moved, Joe Gryder seconded, that Larry Pendergrass be elected by acclamation. The motion carried. Linda Pendergrass was nominated by the Nominating Committee to serve as Vice Treasurer. There being no other nominations, Keith Flatness moved, Joe Gryder seconded, that Linda Pendergrass be elected by acclamation. The motion carried. Chairman Keith Flatness congratulated the new officers and turn the meeting over to Chairwoman Bitsy Gryder. Chairwoman Bitsy Gryder stated the meetings of the Rhea County Republican Party would continue to be held at the Rhea County Sheriff’s Training Center, on the first Thursday of each month, at 7:00PM. Glen Casada, Speaker of the Tennessee General Assembly, will be the Keynote Speaker for this year’s Reagan Day Dinner (April 13th 2019, at Rhea County High School. Laura Travis will have tickets available for purchase at the March meeting. For several years we have heard various proposals that would do away with the “progressive income tax” (repeal the 16th Amendment), and institute a national sales tax. This proposal for a national sales tax is most commonly known as the “Fair Tax.” Given that we have seen how our current tax system was, during the 0bama regime, weaponized against conservative activists, should we finally band together and, with a strong and unified voice, call for the institution of the Fair Tax? Should such it be instituted with the stipulations that the national sales tax rate should be set at 17%, and that a 3/5 majority vote from both the House of Representatives and Senate, plus a signature by the President, be required to increase the established rate, and that any increases made to the established rate must be reauthorized each year, or else the national sales tax rate would automatically revert back to the original 17% level? Please email your thoughts to: pyrope84045@mypacks.net Thank you. “My colleges on the other side of the aisle claim that they want the truth, that they want transparency and fair oversight, yet the Democrats’ witness to testify before Congress today is none other than a scorned man who’s going to prison for lying to Congress. “If you read the sentencing report on Mr. Cohen, words like ‘deceptive’ and ‘greedy’ are scattered throughout that report; it paints a picture of a narcissist, a bully who cannot tell the truth, whether it’s about the president, or about his own personal life, but today, he’s the majority party’s star witness. If the Democrats were after the truth, they’d have an honest person here testifying, and if they were really after the truth, they’d not restrict the questioning to just a few topics. Representative Scott DesJarlais (TN-4th District), along with Representative Julia Brownley (D-CA), announced the formation of the Congressional Range and Testing Center Caucus (CRTCC). The bipartisan representatives, who represent large military communities in their districts, will serve as co-chairs of the forum to educate fellow Members of Congress about Department of Defense range and testing facilities, such as Naval Base Ventura County in California and Arnold Air Force Base in Tennessee. “As the proud representative of Naval Base Ventura County and the more than 19,000 personnel who work hard there every day to keep our nation safe and secure, I know how critical range and testing centers are to ensure our troops have the best technology available to help defend our country,” said Rep. Brownley. Betsy Gorisch, a reader from Knox County, TN, offered the following view on Colorado’s recent legislation (SB19-042), which would convey all electoral votes from the state to the candidate who won the majority of the popular vote. “They are relentless. Like the Borg. They never stop, no matter what anyone else might do to undercut them here or there. They keep plowing on as though nothing has changed. “Rush heard from a caller in Colorado one day not long ago. The caller told him about this. Rush had not heard about it, and evidently was not ready to believe it was actually true. I had to turn him off after that so I do not know whether or not he ever heard the actual status of the thing. I don’t know. Maybe Snerdley [Wayne Golden], looked it up and told him. Or not. “As a good friend of mine has noted, this is how they do it. They will keep ramming away at it in one state after another, and at some point it will have become powerful enough, gained enough Electoral College numbers, to change presidential election results. And most people will be stunned, having never heard of it. And at that point it will have grown too late to do much about it. “Three Illinois Republicans have filed a House resolution calling for Chicago to become the 51st state. “HR101, filed by Rep. Brad Halbrook (R-Shelbyville), Rep. Chris Miller (R-Robinson) and Rep. Darren Bailey (R-Louisville) calls on the United States Congress to separate the city of Chicago from the rest of Illinois. “Halbrook told his hometown paper his reason for filing the resolution was to ‘show the disconnect’ between the northeast corner of Illinois and the rest of the state. “The resolution cites perceived political differences between the state’s largest city and the rest of Illinois, such as policies on gun ownership, abortion, immigration, and other issues. “Historically, Republican statewide candidates carry more of the state’s total geographic area, though Democrats usually fare better in more population-dense regions. “We are rapidly advancing deeper into a post-law, post-constitutional era. A conservative friend was lamenting over the progression of the National Popular Vote Interstate Compact (NPVIC), and how it will affect future elections, bypassing the Electoral College. Twelve states have already enacted NPVIC into law, possessing 172 electoral votes. Colorado will soon become the thirteenth state. If you believe this push is just a Democrat thing, you would be wrong. More than twenty Michigan Republican lawmakers traveled to Hawaii, Puerto Rico, and other vacation spots in the past two years, where they attended seminars sponsored by a California group pushing to change how Michigan awards its electoral votes for president. Michigan Republican Party Chairman Saul Anuzis, was listed in 2016 as the organization’s vice president. The group reported paying Anuzis $120,000 in its tax filing that year. The National Popular Vote, meanwhile, paid a reported $120,000 to Coast-to-Coast Strategies, an Anuzis firm, on its 2016 tax filing. “Many conservatives are hoping that SCOTUS will step in and stop this ‘unconstitutional’ usurpation. What constitution? I replied. It is not even a speed bump in our modern body politic. Conservatives, for the most part, just don’t get it. They still believe we can defeat the Left’s progressive political machine through using the law. This kind of naive thinking is one of the big reasons why conservatives get their collective arses kicked by the far superior, savvy progressive machine. As my Reagan Administration friend, Mark Kreslins said, ‘If you can’t tip your hat at evil, and appreciate just how clever evil is and how successful they have been at changing our culture, you really should sit in the stands and pray; you’re not ready for the fight before us. “Fleeing poverty and crime do not met the criteria for seeking asylum in the US!!! Those migrants are not being persecuted for their religious nor political beliefs. We have our own U.S. citizens who live in poverty and in areas of high crime. The south side of Chicago is only one of many. International law states asylum seekers must seek asylum in the first country they enter, that would be Mexico for Central American migrants. The STATE, not the individual, has the right to either grant or deny asylum. International law states an individual has no right to asylum enforceable vis-a-vis the state of refuge. “Rep. Alexandria Ocasio-Cortez has it right. The world will indeed end in 12 years, as she says. Surely so at the rate she’s going, along with the rest of her Socialist Democrats. “We are doomed if we don’t do something about climate change, she warns – and do it fast, or else the sun won’t come out tomorrow. “How can she be so sure, sure enough to deserve a lollipop? She is 29 and like her House Sisters in Socialism and anti-Semitism, Reps. Ilhan Omar and Rashida Tlaib, she already knows everything – from her years as a bartender. “Or maybe she got her wherewithal from the sayings of Chairman Bernie Sanders, for whom it’s high time to purge our Democracy. Maybe not the rest of the world, this cruel fate of Armageddon, but the United States will sure feel belly-up under the Socialist system she and the others propose. “Already the results are in from Ocasio-Cortez’s Socialist program, as seconded by her Party and as mapped from Joseph Stalin’s Five-Year Plans. “Stalin’s handiwork, based on collectivism run by the government, caused the Great Famine of 1932/33. Millions starved to death – some five million in the Ukraine alone. “Tennessee Representatives Cursio, Sanderson, and Eldrige “opposed” a resolution to Support President Trump in “banning Birthright Citizenship for children of non-citizens”! These children are commonly known as anchor babies. “The term “birthright citizenship” refers to the current practice of considering children born in the United States to automatically acquire U.S. citizenship. This issue is also commonly termed the “anchor baby” issue. These terms describe an issue that is related to and complicates administration of our immigration law because our immigration admission criteria is based so heavily on family relationships and U.S. citizens are able to sponsor extended family members for legal immigration status. We have the right as individuals to give away as much of our own money as we please in charity, but; as members of Congress, we have no right to appropriate a dollar of the public money [for charitable purposes.] – David “Davy” Crockett, Tennessee Congressman, Frontiersman, Fierce Patriot, 1786 – 1836. At first blush, Alexandria Ocasio-Cortez’s (ACO), election to congress seems analogous to the proverbial turtle on top of a fencepost. We know the “turtle” didn’t get there by herself, she definitely doesn’t belong there, she doesn’t seem to know what to do now that she’s there, and we just have to wonder what kind of a person would have put a turtle on a fence post in the first place. In looking at ACO’s rise to power, perhaps our first thought is we now have proof positive that more than half the voters in her district are stupid, but further analysis makes it apparent that the voters in her district were played by some pretty clever people who, like in many instances, didn’t take the time or make the effort to see what was going on behind the veil. As we dig further into the ACO phenomenon, it becomes obvious that she is nothing more than a proxy for those who (at least for now), are satisfied to remain mostly in the shadows. It is obvious that ACO’s campaign was well-funded, well-run, and shows cause to believe that her campaign was expertly managed by some kind of well-organized cabal. In conducting an assessment of Alexandria Ocasio-Cortez we see a young, vibrant, enthusiastic woman who is just smart enough to deliver the message of her handlers and just dumb enough to believe she is actually the master of her own fate. The perfect proxy! One of AOC’s primary backers is a group known as the “Justice Democrats.” They trained her well in Leninist-style tactics, and that group might be best defined as “Democratic Socialists,” which is just another term for “plain old socialists.” One Saikat Chakrabarti, a multi-millionaire, is a co-founder of the Justice Democrats; he graduated from Harvard, with a degree in engineering, and he seems to be the brains of that organization. We come to understand what drives Chakrabarti when we realize that he previously worked in Bernie Sanders’ presidential campaign. He was credited with having closed a 60 point gap between Sanders and Clinton – no insignificant feat – and, had it not been for the work done by Debbie Wasserman-Schultz and Donna Brazile to sabotage the Sanders campaign, Chakrabarti might well have seen his candidate rise to become the Democrat presidential nominee in the 2016 election. Alexandria Ocasio-Cortez is not the only trophy attributed to Chakrabarti and the Justice Democrats in the 2018 midterms. In fact, 26 of the 79 candidates he and the Justice Democrats backed won their elections! Again, no insignificant feat. You have probably heard about the “Green New Deal;” it has gained the interest of the uber-leftists in Congress, but several independent and governmental groups tell us that implementing this legislation will run up our national debt anywhere from 51 to 93 trillion dollars over the next ten years. This, of course, would most certainly destroy the United States economy (which is, of course, the goal of its backers), but even they understand (and generally accept) that the “Green New Deal” will never be passed in its entirety. And they’re perfectly OK with that! After all, socialists and communists have always taken the incremental approach, nudging their agenda along a little at a time until a tipping point is reached. There is, however, at least a momentary glimmer of hope, and the hope is that the Justice Democrats and the Democrat Socialists of America have overplayed their hand. Alexandria Ocasio-Cortez and Saikat Chakrabarti have apparently violated campaign finance laws by funneling some $885,000 in contributions from political action committees (the Justice Democrats PAC and The Brand New Congress PAC), to private companies controlled by Chakrabarti. Unfortunately, and in spite of the observations made by Tom Anderson, spokesman for the National Legal and Policy Center (NPLC), who said in a statement that “these are “not minor or technical violations,” the ways the FEC laws are written requires a prosecutor to prove that the accused parties understood that what they were doing was in violation of campaign finance laws. Since it is inconceivable that a Federal Election Commission (FEC) prosecutor can demonstrate beyond reasonable doubt that any individual on the ACO team fully understood all the intricate workings of campaign laws (certainly, no one could seriously make the claim that ACO understands them! ), the efforts of the Justice Democrats and the Democrat Socialists of America to push their agenda will, at best, be only momentarily slowed down. Still, the take-away from all the chicanery woven into the Justice Democrats, the Democratic Socialists of America, the Brand New Congress, and other socialist and communist organizations must serve as an alarm for those of us who wish to preserve our Constitutional Republic. These are the “unseen hands” behind Alexandria Ocasio-Cortez and the other anti-America socialists who have crept into positions of power within our government. These subversive groups are clever, they are energetic, they are committed to their cause and, they are unrelenting. The only way those of us who claim the mantle of patriots can defeat them is to be willing to rise and do what is within our power to defeat them. Every effort that every individual makes is meaningful! We must educate ourselves and learn the truth, we must remain fully engaged in the political process, we must share what we learn with others and we must learn from our fellow patriots. We must be willing to put our shoulders to the wheel if we are going to turn our Ship of State around and steer it back onto the course set by our Founding Fathers. Amendment Filed TN PAWS Act (Griffey, R-Dist. 21 pages) Amends (rewrites) SB1277 and HB852 to more clearly define the parameters of “animal cruelty” and to strengthen the penalties for those who commit acts of animal cruelty. HB 1273/SB 1500 AN ACT to amend Tennessee Code Annotated, Title 2 and Title 3, Chapter 18, relative to political party affiliations. Also referred to as the Political Party Registration Act. (Holt, R-Dist. 76 and Hensley, R- Dist. 28, respectively, 7 pages). This is a bill to amend Tennessee Code Annotated, Title 2 and Title 3, Chapter 18, relative to party affiliation. The bill would require voters to register by party affiliation and prevent crossover or “mischief” voting. HB 0614 (SB 1167) Tennessee Lawful Housing Act, (Griffey, R-Dist. 75 and Hensley, R-Dist. 28, respectfully), has been passed in committee and will be voted on in the coming weeks. This bill makes it unlawful to lease or rent a dwelling unit to an illegal alien. Curtis Johnson, Clay Doggett, Timothy Hill, Christopher Hurt, and Dave Wright are the committee members who voted in favor of this bill. HB 716 (SB 1409) AN ACT to amend Tennessee Code Annotated, Title 39 and Title 55, relative to driving under the influence. (Griffey, R-Dist. 75 and Bell, R-Dist. 9, respectfully), follows suit with 16 other states that have enacted “per se drugged driving statutes” making it illegal to operate a motor vehicle while under the influence of an illegal drug. HR 8 Bipartisan Background Checks Act of 2019. (Thompson, D-CA, 8 pages). The purpose of this Act is to utilize the current background checks process in the United States to ensure individuals prohibited from gun possession are not able to obtain firearms. It is titled as “bipartisan” since Peter King (R-NY), and other Republicans co-sponsored it. The bill amends Title 18 of the US Code, Section 922, to make it unlawful for any person who does not hold a Federal Firearms License (FFL) to exchange a firearm with any other citizen. (See Section 3 (3) (t) (1) (A)), as well as Sections 4 through 6), unless the transfer is conducted between kin and domestic partners.) In Section 3 (3) (D) is a hidden reference to what has been termed as “Red Flag” legislation, wherein a family member or acquaintance of an individual whom others may claim is potentially inclined to commit a crime or cause bodily harm to themselves or others can have their legally-owned firearms, for an indefinite period of time, confiscated by law enforcement. This bill is another incremental step in usurping citizens’ rights under the 2nd Amendment. This bill was passed in the House of Representatives and has been forwarded to the Senate for consideration. HR 1112 Enhanced Background Checks Act of 2019. (Clyburn, D-SC, 6 pages). This bill amends Chapter 44 of Title 18, US Code, to strengthen the background check procedures to be followed before a Federal firearms licensee may transfer a firearm to a person who is not such a licensee. This bill passed in the House of Representatives on 28 February, and has been forwarded to the Senate for consideration. Three Republicans, Peter King of New York, Chris Smith of New Jersey, and Brian Fitzpatrick of Pennsylvania voted to pass the bill. This bill is another incremental step in usurping citizens’ rights under the 2nd Amendment; your Senators need to know your thoughts on this legislation. RANDOM THOUGHTS Politicians keep passing gun laws imposing restrictions on the law-abiding; when they do, we obey them. The problem is, the crimes are committed by criminals who, by definition, do not obey these gun laws. So, politicians keep passing laws that impact the people who are NOT a part of the problem, and they expect things to change. This is beyond stupid AND it is in diametrical opposition to our fundamental rights! HR 525 Strengthening the Health Care Fraud Prevention Task Force Act of 2019. (Walden, R-OR, 9 pages). The purpose of this bill is to amend Title XI of the Social Security Act to direct the Secretary of Health and Human Services to establish a public-private partnership for purposes of identifying health care waste, fraud, and abuse. This bill was passed in the House of Representatives and forwarded to the Senate for consideration. HR 539 Innovators to Entrepreneurs Act of 2019. (Lipinski, D-IL, 7 pages). This bill would require the Director of the National Science Foundation to develop an I-Corps course to support commercialization-ready innovation companies, and for other purposes. This is a well-intentioned bill that provides funding for training for individuals who have completed courses offered via the National Science Foundation Innovation Corps Program (I-Corps), to public and private entities engaged in technology transfer or commercialization of technologies, and other entities, as determined appropriate by the Director. Funding of $5 million per year would be set aside for such training. Whether demonstrated achievements or demographic set-asides would be used to determine whom may apply for these benefits is not mentioned in the text of the bill. This bill was passed in the House of Representatives and has been forwarded to the Senate for consideration. H Res 144 Providing for the consideration of the Joint Resolution (H J Res 46) relating to a national emergency declared by the President on February 15, 2019. (Torres, D-CA, 2 pages). The resolution was passed by a vote of 229/193, along party lines. On 28 February, the committees returned the bill to the Speaker, who placed it on the calendar to be voted on. Since being returned to the Speaker, numerous resolutions have been added to the bill (primarily by the committees to whom it was given for consideration), and the resolutions have been voted on. In each case, the resolutions passed on a strict party line vote. On 8 March, HR 1 was passed in the House of Representative by a strict party line vote of 234/193. Senator McConnell has stated the bill will be brought to a vote as quickly as possible. HR 762 Streamlining Energy Efficiency for Schools Act of 2019. (Cartwright, D-PA, 4 pages). This bill provides coordination from the federal government in achieving retrofitting assistance for public schools. The coordination flows through Office of Energy Efficiency and Renewable Energy (OEERE), and would ultimately require all public school systems to work through the OEERE to contract with government-approved providers of renewable energy systems (See Section 2 (e) (3) (B)). The bill passed in the House of Representatives on 5 March, and has been forwarded to the Senate for consideration. HR 1271 Vet HP Act (Kaptur, D-OH, 8 pages). This bill establishes in the Department of Veterans Affairs a pilot program instituting a clinical observation program for pre-med students preparing to attend medical school. It is designed to increase the awareness, knowledge, and empathy of future health professionals toward the health conditions common to veterans; increase the diversity of the recruitment pool of future physicians of the Department, and; expand clinical observation opportunities for all students by encouraging students of all backgrounds to consider a career in the health professions. The bill passed in the House of Representatives on 5 March, and has been forwarded to the Senate for consideration. HR 758 Cooperate with Law Enforcement Agencies and Watch Act of 2019. (Hill, D-AR, 3 pages). As the law is currently written, financial institutions are open to breach of privacy suits if they disclose the names of persons who conduct the transfer of funds by wire or other methods within and under the control of said financial institutions. This bill relieves the financial institute of liability for disclosure if such information is provided to a law enforcement agency that has provided a duly executed warrant. HR 736 Access to Congressionally Mandated Reports Act. (Quigley, D-IL, 11 pages). This bill requires the Director of the Government Publishing Office to establish and maintain an online portal accessible to the public that allows the public to obtain electronic copies of all congressionally mandated reports in one place, and for other purposes. H Res 183 Condemning anti-Semitism as hateful expressions of intolerance that are contrary to the values and aspirations that define the people of the United States and condemning anti-Muslim discrimination and bigotry against minorities as hateful expressions of intolerance that are contrary to the values and aspirations that define the people of the United States. This resolution was a response to Ilhan Omar’s (D-MN), anti-Semitic remarks toward Jewish people and the nation of Israel, in general, and especially toward those Jewish members of the AIPAC organization. The resolution passed by a vote of 401/23. The 23 “nay” votes were cast by Republicans because Ilhan Omar’s name did not appear in the resolution. HR 582 Raise the Wage Act. (Scott, D-VA, 11 pages). This bill would raise the minimum wage to $15.00 per hour over a six year period. S 729 A bill to prohibit the use of funds to Federal agencies to establish a panel, task force, advisory committee, or other effort to challenge the scientific consensus on climate change, and for other purposes. (Schumer, D-NY, 4 pages). In 1990, the Global Change Research Act was signed into law. This legislation provided federal funding to a select group of “scientists” (Council) who were tasked with providing “proof” that: global warming has been, and is presently, occurring, and; that “global warming” is the direct result of human impact on the environment since the beginning at the Industrial Age. In accordance with Title 15, US Code 2936, subsection 106, the Council was tasked with providing a report NLT every four years to Congress and the President on: the current findings of the Program; an analysis of the overall effects of “global change,” and; an analysis of current trends along with predictions for the future. In the 29 years since the initial report to Congress, the findings of this select group have been expanded to include members with appropriate credentials who hold diverse views to the original group of appointees. Over the past few years, the reports generated by the Council have run contrary to the opinions held by the original human-caused global warming alarmists who had made wild and false predictions on the conditions of our planet if their suggested laws were not immediately enforced. Therefore, Chuck Schumer no longer wishes to fund the Council since their current reports do not fit his narrative. H J Res 46 Relating to a national emergency being declared by the President on February 15, 2019. (Castro, D-TX, 3 pages). This bill was introduced on 22 February, and railroaded by Nancy Pelosi, Speaker of the House of Representatives, on 26 February. It was then forwarded to the Senate for consideration, where it was brought to a vote on 13 March. Twelve Senate Republicans voted with Chuck Schumer and the Democrats to pass the bill: Mitt Romney, R-Utah, Mike Lee, R-Utah; Rob Portman, R-Ohio; Susan Collins, R-Maine; Lisa Murkowski, R-Alaska; Marco Rubio, R-Fla.; Rand Paul, R-Ky.; Lamar Alexander, R-Tenn.; Roger Wicker, R-Miss. ; Roy Blunt, R-Mo. ; Jerry Moran, R-Kan.; and Pat Toomey, R-Pa. President Trump vetoed the resolution and took action to move ahead with declaring a national emergency to fund a border wall. There are not a sufficient number of votes to override his veto. Article One is the Constitution’s section detailing the powers of Congress, since the body was intended by the Founders to be more powerful than the presidency, which in recent decades has in many policy areas ceased to remain true. Supporters argue that the legislative branch has weakened itself when it comes to declaring national emergencies, caving to presidential power, and that an imperial presidency has resulted unless Congress reverts back. Senator Lee stated “if Congress is troubled by recent emergency declarations made pursuant to the National Emergencies Act, they only have themselves to blame. Congress gave these powers away in 1976 and it is far past time that we, as an institution, take them back. President Trump argues that he has not only the right but the responsibility as President to declare national emergencies as he sees fit – and this one specifically. “Since 1976, Presidents have declared 59 national emergencies. They often involved protecting foreign citizens in far-off lands, yet Congress has not terminated any of them. Every single one of them is still in existence. S Res 59 A resolution recognizing the duty of the Federal Government to create a Green New Deal (Markey, D-MA, 6 pages). The Senate roundly rejected Alexandria Ocasio-Cortez’s “Green New Deal” without one Senator voting “Yea” on the bill. The vote was 57 “Nays” and 43 voting “Present.” Joe Manchin (D-WV), Krysten Sinema (D-AZ), and Doug Jones (D-AL) were the only “Nay” votes from the Democrats. S 151 TRACED Act (Thune, R-SD, 8 pages). Otherwise known as the Telephone Robocall Abuse Criminal Enforcement Deterrent Act is a bill that criminalizes entities that make unsolicited calls for the purpose of selling products. Most every conservative person I know – as well as a few of my “moderate” Democrat friends – are concerned by the rise of socialism in America. Many folks seem to think this is a new phenomenon; it is not. This month, I’d like to present some research I’ve done on the history of socialism in the United States, and offer what is perhaps one explanation of its continual revivals. The first socialists seem to have arrived in America, back in the 1850s. These were primarily German immigrants who founded Marxian socialist trade unions; e.g. the National Typographic Union (1852), Iron Moulders of North America (1859), etc. They believed that socialistic practices could prevent their being victimized by the periods of economic booms and depressions. The Socialist Party of America, led by Eugene V. Debs (who had been jailed as the result of his actions in the 1897 Pullman Strike), seems to have been “officially born” after Deb’s release from prison, and grew dramatically during the years between 1900 and 1912; during this time 160 councilmen, 145 aldermen, one US Congressman, and 56 Mayors (including in Milwaukee, WI, Berkley, CA, and Schenectady, NY) were elected as Socialists. Debs, a perennial presidential candidate, began to gain national traction when he ran for President on the Socialist ticket in 1912. He received 900,000 votes (6% of the votes cast that year), he was endorsed by the more than 300 socialist newspapers of the day, and backed by such notables as Jack London and Upton Sinclair, who founded the Intercollegiate Socialist Society. Prior to that, in the 1904 election, Theodore Roosevelt, founder of the Progressive Movement, was able to co-opt the Socialists Party membership to gain the presidency. Roosevelt’s success in this vein was in that he adopted the Socialist stance that utility companies (electric, water, natural gas) should be owned by municipalities, as opposed to being privately owned. (Another socialist plank in Roosevelt’s platform was his promise to break up all “monopolies.”) Roosevelt had clearly outfoxed the socialists. Anticipating there might be another subversive third party presidential contender at some time in the future, the Democrats and Republicans had taken measures to counter any future presence by the Socialists. In 1917, The Espionage Act was signed into law to jail anyone who “interfered with the draft or encouraged disloyalty [to America”]. This was quickly followed by The Sedition Act, which jailed anyone interfering with the sale of War Bonds. Decrying the betrayal of Woodrow Wilson for having mired the United States into WWI, Debs ran for President again in 1920, and garnered 919,800 votes that year (the most votes ever received by a presidential candidate running as a Socialist). Many of Deb’s supporters were the veterans of WWI, and the families of soldiers who had lost their lives in the trenches. As early as 1925, the socialist movement realized the value of promoting socialism in public schools, and Margaret Haley (under the mentoring of John Dewey), helped this cause when she founded the American Federation of Teachers. In 1928, the mantle of the perennial Socialist Party presidential candidate was taken up by a Presbyterian minister and Princeton graduate Norman Thomas. (Thomas ran again in the 1932 and 1936 elections.) Unlike Debs, Thomas was more indicative of the members of the Socialist Party who were (and still are! ), comprised of intellectuals, academicians, and middle class, as opposed to the working class Americans whom Debs had represented. The snobbery of the former caused rift with the latter and cost them greatly in terms of political clout. However, the socialists and communists gained ground with their claim that the Great Depression was proof that capitalism had failed. FDR’s concessions (if not outright capitulation) to the socialists and communists was recognized by the Republicans as “creeping socialism.” Friedrich Hayek’s book The Road to Serfdom (1944), warned about the dangers of state control over the means of production, especially in regards to the Tennessee Valley Authority, during the New Deal and Fair Deal. Hayek believed that excessive governmental controls on society were ultimately harmful to Americans and were economic failures. According to Hayek, socialism strips humankind of the desire to succeed. By the 1950s, the intensification of the Cold War and the substantial economic gains realized by “Middle Class America,” drove many party members away. The exposure of socialism and communism provided during the McCarthy era drove the remaining members and their leaders “underground.” They found refuge and became active within the Democrat Party. Walter Reuther (a labor unionist who organized the United Auto Workers), Philip Randolph (President of the AFL/CIO whose early work involved helping Margaret Haley to solidify the American Federation of Teachers), and Bayard Rustin were among the more notable to have defected. They were quick to be embraced by the Democrats who promised America a more progressive government that would lead all Americans to a successful, prosperous, and egalitarian future. The socialists of today remain somewhat factionalized between the neo-Nazis and the National Socialist Movement, and the Socialist Party U.S.A., Democratic Socialists of America, The National Alliance, Young Democrat Socialists of America, and the Democratic Progressive Party. Both factions have two things in common: they are both anti-Semitic and they both invariably support Democrat Party candidates. In fact, they are overwhelmingly registered as Democrats in those states where party registration is required by law. Both factions share the belief that the United States must be re-formed as a state ruled by “Democratic Socialism,” where the production and distribution of goods should be managed by democratically controlled public agencies, cooperatives, and other collectivist systems. As for growing the new crop of socialists, the teachers’ unions are playing an integral role. Their goal to shift the political profile of America by indoctrinating students at all levels of academia, is clearly explained in a publication entitled Why Socialists Should Become Teachers. https://teachers.dsausa.org/. Their astounding success is perhaps best illustrated in polls that show that an incredibly large percentages of “Millennials” (49%), https://www.chicagotribune.com/news/opinion/chapman/ct-perspec-chapman-young-socialism-capitalism-20180520-story.html, and “Generation Z” (39%), favor socialism. https://www.axios.com/socialism-capitalism-poll-generation-z-preference-1ffb8800-0ce5-4368-8a6f-de3b82662347.html. History has shown us that socialism is best countered when free-market capitalism is strongest and when citizens elect representatives who favor small government and maximum individual freedom, but the deep-rooted indoctrination centers that are our public schools and universities show us that the enemies of individual liberty have steadily been gaining ground. Is it too late to undo the harm caused by the spreading cancer of socialism in America? This is a question each individual must answer for themselves! Link above provides all methods of contact.